Australia has sent a naval ship to help evacuate thousands of people from Vanuatu’s Ambae island, where a volcano is threatening a major eruption. The Vanuatu government announced last week that all 11,000 residents on Ambae in the north of the Pacific archipelago would be moved, after the Manaro Voui volcano rumbled to life and rained rock and ash on villages. “Vanuatu is part of a group of Pacific islands that is prone to natural disasters — whether it is earthquakes, cyclones (or) volcanic activity,” Foreign Minister Julie Bishop told the Australian Broadcasting Corporation Sunday. Most of the island’s residents have been sheltering in evacuation centres since the volcano first sent up a plume of steam and ash about a week ago. 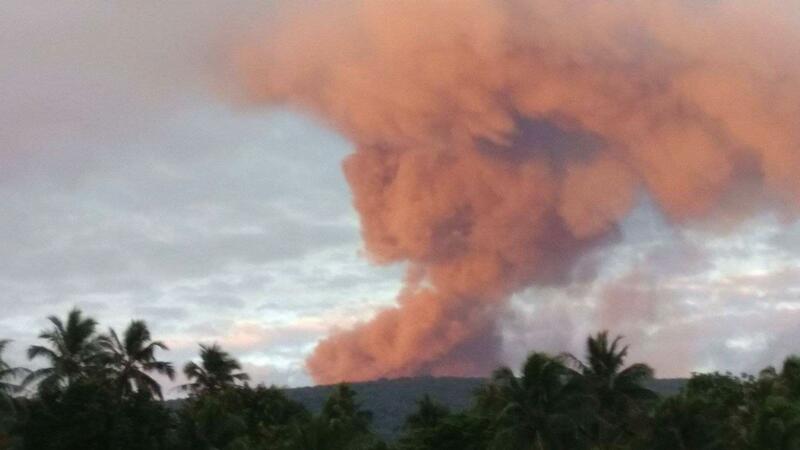 Vanuatu’s government has acknowledged it is not well-prepared for a volcanic emergency and has called for international assistance. Vanuatu-based journalist Dan McGarry, who visited Ambae at the weekend, told AFP that evacuation efforts were “calm and orderly” but many residents were upset at being uprooted. “There’s a deep sense of concern and a palpable sense of loss, among the people that are being forced to leave the island,” he said. Vanuatu lies on the Pacific “Ring of Fire” where tectonic plates collide, causing frequent seismic and volcanic activity.